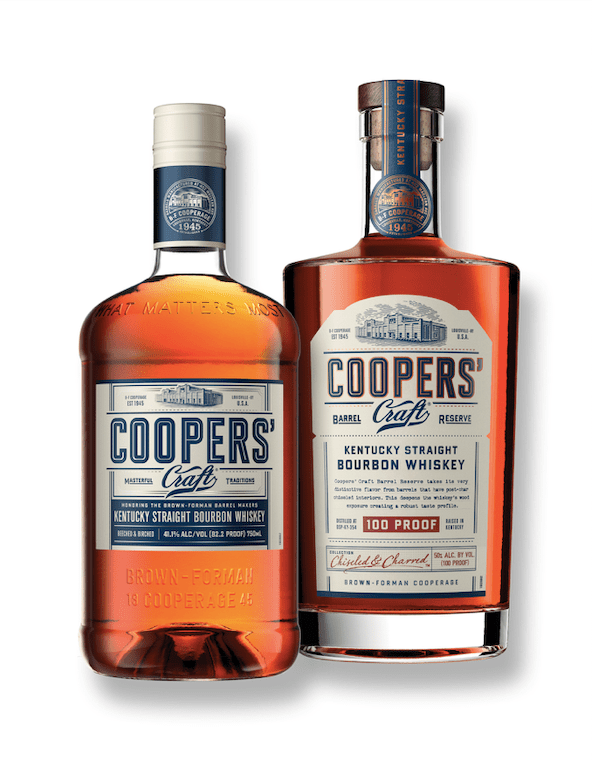 Brown-Forman dropped its Coopers’ Craft Bourbon just 2 1/2 years ago (its first new bourbon brand in 20 years), and now its out with its first line extension: A 100 proof version of the whiskey intended to honor the craft of the cooper, the guys who make the barrels. Labeling on the original Coopers’ Craft has also been updated significantly, making it a bit more old-timey. Coopers’ Craft Barrel Reserve isn’t just higher in proof, it’s also aged differently. They start with the same base distillate, then the original Coopers’ Craft bourbon is aged in a traditional American oak barrel, then “run through a special beech and birch charcoal filter finishing process.” In contrast, “Coopers’ Craft Barrel Reserve is aged in a unique chiseled and charred American White Oak barrel that allows the whiskey to interact more deeply with the wood, creating a robust and more complex flavor profile.” Also note: No filtering. The new Coopers’ Craft features a bourbon-traditional nose, showcasing vanilla candies and barrel char, apple cider, and a hint of fresh herbs. On the palate, the whiskey develops in some interesting ways. Notes of well-torched creme brulee, macerated cherries, and an orange peel note all mingle on the tongue. While mildly spiced at first, these notes build as the palate races toward the finish, which acquits itself with a racy, spicy, almost peppery experience. If you want something more instantly approachable, water is a solid idea here — and it brings out some notes of tea leaf that you otherwise might miss. Compared to the standard Coopers’ Craft, the good news is that Barrel Reserve is a very different whiskey, and a moderately better one at that. The even better news is that Brown-Forman isn’t gouging your wallet when it comes to the upgrade in proof and taste, making it an easy pick as an everyday sipper.